Up to the 1930s the Steam Lorry was a popular alternative to the horse or traction engine for medium weight road haulage. There were two main types, the Overtype which was like a small tractIon engine at the front with the cylinder on top of a horizontal locomotive type boiler, and the Undertype which typically had a vertical boiler in the cab (the Yorkshire type having a transverse horizontal boiler) and the cylinders mounted under the chassis. Many manufacturers made engines of one type or the other, the most common being Foden for the Overtype and Sentinel for the Undertype. We have chosen the pioneering Atkinson "Standard" Undertype to model along with the slightly later "Super Sentinel". 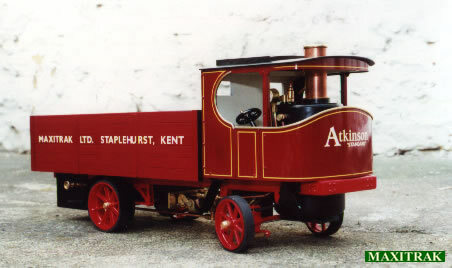 The Atkinson was popular in its time but has many fewer survivors in preservation today. THESE MODELS ARE NOT INTENDED FOR PASSENGER HAULING and so come complete with radio control as standard. They are the same mechanically, the differences being in the cab, wheels and detailing. There are two body styles which are interchangeable, the Box body and the Dray, being available with either model. In the rear is the gas tank and condenser under the body, lift off the body to fill the tank, gas is then fed to the burner at the base of the boiler. Steam is taken from the boiler through the lubricator to the twin oscillating cylinders. These are double acting and the lorry can be stopped, started, reversed and three point turned at will. Exhaust steam is then led to the condenser which will catch the oil and wet from the steam, before it is exhausted through the tail pipe or chimney. The cylinders drive through gear and chain reduction to the rear axle which is equipped with a fully working differential. Both axles are fully sprung with working leaf springs.Two channel radio control works the servos mounted behind the boiler under the chassis, one controlling the steering and the other the engine speed and reversing. The boiler is equipped with pressure and water gauges and will run for approximately 35 minutes before the gas tank, boiler and lubricator need filling. The cab roof is easily removed to give access to the boiler filler. These models are available either fully completed or as a series of kits, giving you the satisfaction of assembling your own model and also allowing the cost to be spread over a period. These model kits are amongst the easiest of their type for kit builders, there are still a good many small parts but there is little drilling and riveting.